I don’t wanna be dramatic but this brand is changing the game. 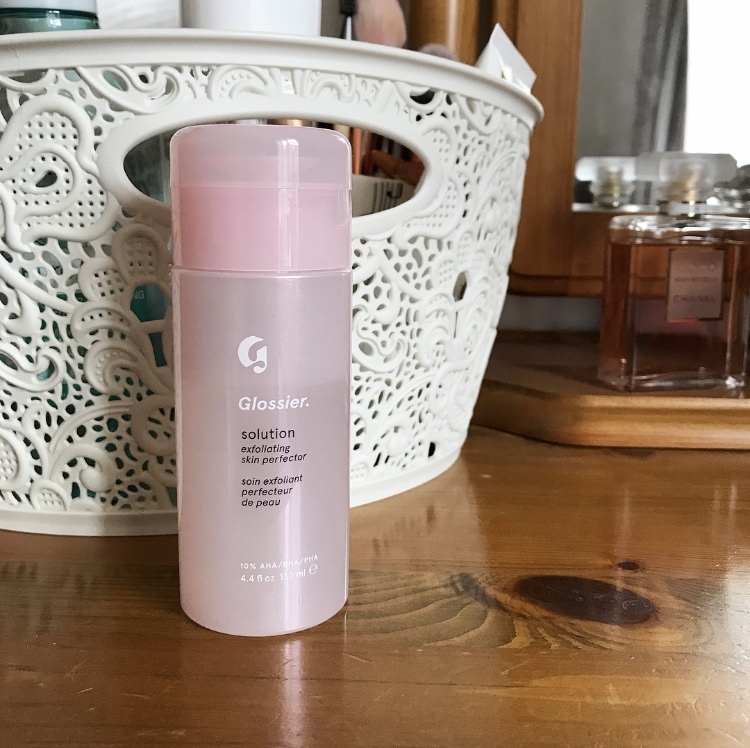 Anyone who regularly wears makeup has probably heard of Glossier by now. The brand is fairly revolutionary, favouring skincare as an active and necessary part of the makeup we wear. Personally, I love this idea, as I tend to go for more minimal makeup, and the best way to feel comfortable with barely any coverage is to focus on skincare first. I've previously tried quite a few of the brand's makeup products, all of which I now regularly use, but at the beginning of the year I decided to try their new and revolutionary Solution. I've left it about two months to give a review, as I think skincare is something that both takes time to work and also takes time for your skin to decide if it likes a product or not. But now, I can say for sure, that this is a product that works for me. This product has been featured a lot on social media as a type of acne cure, or something that certain helps to sooth acne and start clearing it up, even reducing the appearance of scarring. I've personally never had any harsh acne, but prior to starting to use the Solution, I'd started getting little clusters of spots, mostly on the oilier parts of my face and I wanted to do something about it. I was initially sceptical about the results I'd seen online, presuming that the product would, naturally, work better for some people than others, and I'm still sure that that's probably true, but for me it's been really great. I've favoured using the Solution in the evenings, as I always think that evening skincare is both more important and does more work than anything I use in the mornings. This is probably because you're in the same environment the whole time you're sleeping, so your skin doesn't have to adapt to different conditions and therefore the products can work to their full potential. From the get go, I noticed that this product was making a difference. I had some spots on my chin and forehead the first night I tried using the Solution, and they were significant smaller and less red in the morning. I thought maybe it would just be a quick-fix product and then things would get worse straight away during the day, but that wasn't the case. After just the first week of using this, I was so impressed. Whilst I've never had particularly bad acne, when I would get a spot, it would always linger for a long time, at least a week or two, and then would scar. The scarring tended to last for anything from a month to three or four months, which is obviously not ideal. But all the scarring I have had since starting to use the Solution has cleared up, and is either completely gone or barely noticeable. I've still gotten a few spots here and there over the past two months, but they have developed during the day, whilst I'm out and about. I've used the Solution in the evening and they've been almost gone by the time I wake up the next day. Or when I've changed another product in my skincare routine - for example I recently changed moisturiser, as mine was doing very little for me - it's upset my skin a little, but the Solution has still managed to clear up my skin while it's getting used to a new product, but equally not been so harsh that I can't tell if the new product is working or not. It allows you to see a change in your skin as you change products around, but equally isn't so harsh that you end up using products that your skin doesn't actually like. You'd still continue to break out if the new moisturiser wasn't for you, even if the Solution cleaned up the mess, the spots would still comes through. Honestly, this product gives the perfect balance and it 100% does the job. It is a firm favourite of mine and I'm sure will remain a part of my skincare routine for a long time to come. Once I've *finally* perfected my skincare routine (I've just got to be 100% happy with an eye cream, so hopefully it'll be soon! ), I'll do a full skincare post about all the products that work best for me. It's a pretty simple routine, but I think with skincare less is often more.